“And the souls of the wicked are cast into hell, where they remain in torments and utter darkness.” – The Westminster Confession. Can belief in Hell be considered a pathological fear? Consider the stakes for many believers: The prospect of an eternity of torture and other forms of suffering. One might even say a crippling fear of hell would be warranted. With those questions in mind, a team of researchers from Baylor University developed a series of measures on “hell anxiety” and tested them in what they say is the first systematic examination of the psychological consequences of belief in hell. What they found in general was that individual belief in Hell was not in itself connected to any neuroses, and that most people did not display an unhealthy focus on the possibility of eternal damnation. •	The more religious an individual was, the less likely they were to display Hell anxiety. •	Unhealthy fears were not related to dogmatism or religious fundamentalism. •	Free will, or the idea individuals have control over where they will spend their afterlife, was a key element in reducing Hell anxiety. That does not mean belief in hell may not have a dark side when other mediators are involved. The study found those who viewed God primarily with fear, those who believed they were likely to go to Hell and those with a sense outside forces could decide their fate, were more likely to experience greater Hell anxiety and death anxiety. But overall, the results suggested belief in hell should not be considered a pathological fear, “but is perhaps a rational response to personal theological” beliefs, researchers concluded. About half of Americans are absolutely sure of their belief in hell, while the percentage rises above two-thirds when some degrees of uncertainty are included. 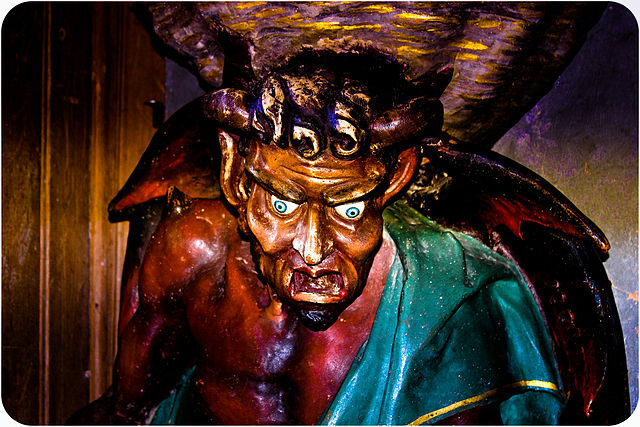 Earlier research into supernatural evil such as Hell, Satan and demons has found both positive and negative outcomes. Belief in supernatural evil has been shown to be linked to results such as increasing religious resources and promoting greater cooperation and less selfish behavior. And warnings about Hell and Satan have been shown to be helpful for many people in living up to divine standards in areas from cultivating successful, lasting relationships to avoiding harmful addictions. In one recent study, a team of researchers from the Netherlands reviewed 15 cross-sectional studies on moral objections to suicide, especially the conviction of going to Hell after taking one’s own life. They found each study supported the idea that moral objections and fear of Hell exerted a restraining effect on suicide. There is also a dark side. Belief in the existence of powerful supernatural evil beings was one of the strongest predictors of poor mental health in young adults, a study by Purdue University researchers found. Yet Hell anxiety has been largely an unexplored topic. And often is addressed with only a single question as part of a larger study on death anxiety. The Baylor study pushes the research forward in several directions, including developing a Hell Anxiety Scale that considers several different Hell beliefs and feelings, along with related measures on topics from free will to psychological distress to afterlife anxiety. The scale was tested in a survey administered to 353 undergraduate students at a Christian-affiliated university. Just 13 percent of the respondents said it was more likely than unlikely they would go to Hell. Most respondents were able to place their understanding of Hell in a broader perspective that protected against Hell anxiety. Some of the lessened fears around Hell may be the result of factors such as the more religious people are, the less likely they will feel Hell is in their future. That may be particularly true for individuals who envision it as a place of eternal torture. “Basically, if you believe in a harsher form of Hell, you’re pretty sure you’re not going there,” said lead researcher Stephen Cranney. Other explanations may include the human tendency not to focus on events far in the future, and to push negative outcomes from their minds as a coping mechanism. But the research also indicated that a strong sense of free will, or that you have control over your destiny, and a positive God image may be strong protective factors. In contrast, in addition to respondents who thought Hell was a likely option, those experiencing the greatest Hell anxiety were people who were more likely to believe their choices are determined by forces outside their control and those expressing fear of God. The results are consistent with a larger body of research showing much more positive health outcomes for those who believe in a loving God who personally cares for them than those who believe in a distant, judgmental deity. There is a great deal of research to be done on the consequences of belief in Hell. But the research so far indicates that those caring for people suffering from an unhealthy fear of Hell may benefit from a greater understanding of how Hell beliefs can impact lives. Part of that may include secular and religious counselors working together to offer different perspectives that may emphasize divine love and mercy or more nuanced understandings of Hell. In the suicide study, researchers said moral objections to suicide is a relevant factor in the exploration of suicidality, or the likelihood of an individual taking her or his own life, in every individual patient. If Hell no longer hath the same nightmarish fury conjured up in many depictions in medieval art, it still has a great deal of relevance in the modern age. Test what you know about belief in Hell with our religion quiz.